Why is the Amazon still under threat? Market forces, population pressure and infrastructure advances are continuing to pry open the Amazon rainforest. As the pressures afflicting the region grow in intensity, it is becoming increasingly clear that the price to be paid is not only loss of biodiversity and habitat – but also of a decreasing life quality for people. 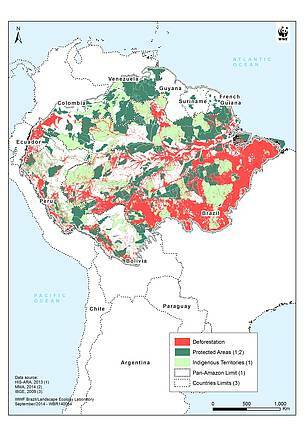 Among the threats behind environmental destruction and degradation in the Amazon are the lack of policy frameworks to support sustainable development and natural resource protection, political instability, the inability of some institutional and governmental entities to establish and enforce legislation for nature conservation, and poverty and inequality. Today, regional government programmes and initiatives are pushing for constant development, often encouraging blind clearance of forests for cattle ranching, oil drilling or soybean production. Such efforts seek to secure much-needed foreign exchange and generally develop economies. As the countries of the Amazon become increasingly integrated into the global economy and there is increased demand for ever-limited natural resources, efforts to protect the region continue to be threatened by unsustainable economic demands. Development activities in the Amazon are responding in part to the insatiable international demand for raw goods. For example, Brazil’s beef exports are closely linked to financial markets and the strength of the Real, the Brazilian currency. When the real devaluated, the price of beef in real approximately doubled, creating a huge incentive for ranchers to expand their pasture area. At the same time, the price of Brazilian beef in dollars fell, which made Brazil’s exports more competitive on international markets.1 Conversely, when the real strengthens, exporters struggle to keep their slice of the market. Responding to international demands in agricultural products requires infrastructure such as dams and roads. BR-163 and BR-319, two of the main roads to be laid down through the Brazilian Amazon rainforest, are examples of this situation. Rates of deforestation vary from one Amazon country to another, mostly because the factors that drive this process also vary across the region. In Brazil for instance, most clearing is carried out in large and middle-sized ranches for cattle pasture, whereas the role of small farmers clearing for agriculture is relatively more prevalent in other countries3. Some deforestation, when carried out in private properties, can be legal. 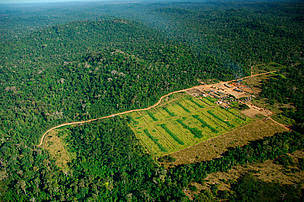 According to the Brazilian Forestry Code (a federal law), 20% of rainforest in each property can be cleared under a license provided by environmental agencies. What are the impacts of deforestation? Loss of biodiversity: Species lose their habitat, or can no longer subsist in the small fragments of forests that are left. Populations dwindle, and eventually some can become extinct. Because of the high degree of endemism, or presence of species that are only found within a specific geographical range, even localized deforestation can result in loss of species. Modified global climate: The forests’ ability to absorb the pollutant carbon dioxide (CO2) is reduced. 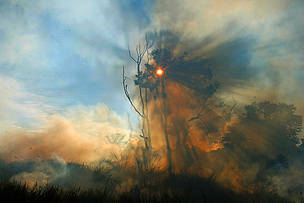 At the same time, there is an increased presence of CO2 released from the burning trees. Social impacts: With reduced forests, people are less able to benefit from the natural resources these ecosystems provide. This can lead to increased poverty and in cases, people may need to move in order to find forests which can sustain them. The demand for land that is currently causing tropical forests to be burned is expected to remain high, sustaining the continued release of carbon from burning trees into the atmosphere. 1 Kaimowitz et al. 2004. 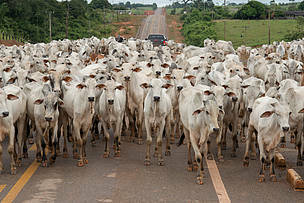 Hamburger Connection Fuels Amazon Destruction: Cattle ranching and deforestation in Brazil's Amazon. Centre for International Forestry Research (CIFOR). 10 pp. 2 International Herald Tribune. Sunday, November 20, 2005. China's global push for resources makes waves in Amazon basin. 4 Barreto et al. 2005. Human Pressure in the Brazilian Amazon. IMAZON. 7 Lewis, S.L. 2005. Tropical Forests and Atmospheric Carbon Dioxide: Current Knowledge & Potential Future Scenarios. Avoiding Dangerous Climate Change Symposium, Exeter, 1-3 February 2005.